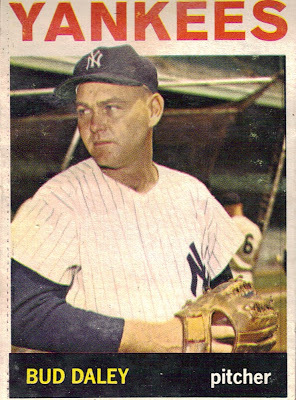 Bud Daley, a southpaw knuckleballer in the 1950s and 1960s, was a two-time All-Star for the KC Athletics and ended his career with three-and-a-half years in New York with the Yankees. His career record was 60-64 with a 4.03 ERA. With the Yankees, he pitched mostly out of the bullpen with his best year coming in 1962. He may be most remembered by old-timers for winning Game 5 in the 1961 World Series against the Reds. He tossed 6-2/3 innings and allowed two unearned runs on a fifth-inning homer to Wally Post. Daley also pitched one scoreless inning the 1962 World Series against the Giants.